USES: Fluvoxamine is used to treat obsessive-compulsive disorder (OCD). It helps decrease persistent/unwanted thoughts (obsessions) and urges to perform repeated tasks (compulsions such as hand-washing, counting, checking) that interfere with daily living. 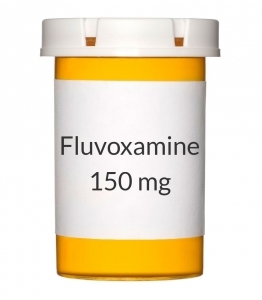 Fluvoxamine is known as a selective serotonin reuptake inhibitor (SSRI). This medication works by helping to restore the balance of a certain natural substance (serotonin) in the brain. OTHER USES: This section contains uses of this drug that are not listed in the approved professional labeling for the drug but that may be prescribed by your health care professional. Use this drug for a condition that is listed in this section only if it has been so prescribed by your health care professional. This medication may also be used to treat depression and post-traumatic stress disorder. HOW TO USE: Read the Medication Guide and, if available, the Patient Information Leaflet provided by your pharmacist before you start taking fluvoxamine and each time you get a refill. If you have any questions, ask your doctor or pharmacist. Take this medication by mouth with or without food as directed by your doctor, usually once daily at bedtime, or twice daily (once in the morning and once at bedtime). If you are taking this medication twice daily and the doses are not equal, then the larger of the 2 doses should be taken at bedtime. The dosage is based on your medical condition, response to treatment, age, and other medications you may be taking. Be sure to tell your doctor and pharmacist about all the products you use (including prescription drugs, nonprescription drugs, and herbal products). In children, the dosage may also be based on their age and gender. To reduce your risk of side effects, your doctor may direct you to start this medication at a low dose and gradually increase your dose. Follow your doctor's instructions carefully. Do not increase your dose or use this drug more often or for longer than prescribed. Your condition will not improve any faster, and your risk of side effects will increase. Take this medication regularly to get the most benefit from it. To help you remember, take it at the same time(s) each day. It is important to continue taking this medication even if you feel well. Do not stop taking this medication without consulting your doctor. Some conditions may become worse when this drug is suddenly stopped. Also, you may experience symptoms such as mood swings, headache, tiredness, sleep changes, and brief feelings similar to electric shock. To prevent these symptoms while you are stopping treatment with this drug, your doctor may reduce your dose gradually. Consult your doctor or pharmacist for more details. Report any new or worsening symptoms immediately. It may take up to several weeks before you get the full benefit of this drug. Tell your doctor if your condition does not improve or if it worsens. SIDE EFFECTS: See also Warning section. Nausea, vomiting, drowsiness, dizziness, loss of appetite, trouble sleeping, weakness, and sweating may occur. If any of these effects persist or worsen, tell your doctor or pharmacist promptly. Remember that your doctor has prescribed this medication because he or she has judged that the benefit to you is greater than the risk of side effects. Many people using this medication do not have serious side effects. Tell your doctor right away if you have any serious side effects, including: easy bruising/bleeding, shaking (tremor), decrease in sexual interest/ability. Get medical help right away if you have any very serious side effects, including: black stools, vomit that looks like coffee grounds, seizures. This medication may rarely cause a very serious condition called serotonin syndrome. The risk increases when this medication is used with certain other drugs (See Drug Interactions section). Get medical help right away if you develop some of the following symptoms: hallucinations, unusual restlessness, loss of coordination, fast heartbeat, severe dizziness, unexplained fever, severe nausea/vomiting/diarrhea, twitching muscles. Rarely, males may have a painful or prolonged erection lasting 4 or more hours. If this occurs, stop using this drug and get medical help right away, or permanent problems could occur. A very serious allergic reaction to this drug is rare. However, get medical help right away if you notice any symptoms of a serious allergic reaction, including: rash, itching/swelling (especially of the face/tongue/throat), severe dizziness, trouble breathing. This is not a complete list of possible side effects. If you notice other effects not listed above, contact your doctor or pharmacist. In the US - Call your doctor for medical advice about side effects. You may report side effects to FDA at 1-800-FDA-1088. In Canada - Call your doctor for medical advice about side effects. You may report side effects to Health Canada at 1-866-234-2345. PRECAUTIONS: Before taking fluvoxamine, tell your doctor or pharmacist if you are allergic to it; or if you have any other allergies. This product may contain inactive ingredients, which can cause allergic reactions or other problems. Talk to your pharmacist for more details. Before using this medication, tell your doctor or pharmacist your medical history, especially of: personal or family history of bipolar/manic-depressive disorder, personal or family history of suicide attempts, liver problems, seizures, low sodium in the blood, intestinal ulcers/bleeding (peptic ulcer disease) or bleeding problems. This drug may make you dizzy or drowsy. Do not drive, use machinery, or do any activity that requires alertness until you are sure you can perform such activities safely. Avoid alcoholic beverages. Before having surgery, tell your doctor or dentist about all the products you use (including prescription drugs, nonprescription drugs, and herbal products). Older adults may be more sensitive to the side effects of this drug, especially bleeding. Older adults are also more likely to develop a type of mineral imbalance (hyponatremia), especially if they are also taking "water pills" (diuretics). Children may be more sensitive to the side effects of this drug, especially loss of appetite and weight loss. Monitor weight and height in children who are taking this drug. During pregnancy, this medication should be used only when clearly needed. It may harm an unborn baby. Also, babies born to mothers who have used this drug during the last 3 months of pregnancy may infrequently develop withdrawal symptoms such as feeding/breathing difficulties, seizures, muscle stiffness, or constant crying. If you notice any of these symptoms in your newborn, tell the doctor promptly. Since untreated depression can be a serious condition, do not stop taking this medication unless directed by your doctor. If you are planning pregnancy, become pregnant, or think you may be pregnant, immediately discuss with your doctor the benefits and risks of using this medication during pregnancy. This drug passes into breast milk. Consult your doctor before breast-feeding. DRUG INTERACTIONS: Drug interactions may change how your medications work or increase your risk for serious side effects. This document does not contain all possible drug interactions. Keep a list of all the products you use (including prescription/nonprescription drugs and herbal products) and share it with your doctor and pharmacist. Do not start, stop, or change the dosage of any medicines without your doctor's approval. Some products that may interact with this drug include: other drugs that can cause bleeding/bruising (including antiplatelet drugs such as clopidogrel, NSAIDs such as ibuprofen, "blood thinners" such as warfarin). Aspirin can increase the risk of bleeding when used with this medication. However, if your doctor has directed you to take low-dose aspirin for heart attack or stroke prevention (usually at dosages of 81-325 milligrams a day), you should continue taking it unless your doctor instructs you otherwise. Ask your doctor or pharmacist for more details. This medication can slow down the removal of other medications from your body, which may affect how they work. Examples of affected drugs include alosetron, cisapride, clozapine, methadone, melatonin, pimozide, ramelteon, tacrine, thioridazine, tizanidine, certain benzodiazepines such as alprazolam/diazepam/triazolam, certain beta-blockers such as metoprolol/propranolol, tricyclic antidepressants such as imipramine, among others. Avoid taking MAO inhibitors (isocarboxazid, linezolid, methylene blue, moclobemide, phenelzine, procarbazine, rasagiline, selegiline, tranylcypromine) during treatment with this medication and for two weeks before and after treatment. In some cases a serious (possibly fatal) drug interaction may occur. Before using fluvoxamine, report the use of other drugs that increase serotonin, such as dextromethorphan, lithium, St. John's wort, sibutramine, street drugs such as MDMA/"ecstasy," tramadol, tryptophan, certain antidepressants including SSRIs (such as citalopram, paroxetine) and SNRIs (such as duloxetine, venlafaxine), "triptans" used to treat migraine headaches (such as eletriptan, sumatriptan), among others. The risk of serotonin syndrome may be more likely when you start or increase the dose of these medications. This medication can increase the effects of caffeine. Avoid drinking large amounts of beverages containing caffeine (coffee, tea, colas) or eating large amounts of chocolate or taking nonprescription products that contain caffeine. Tell your doctor or pharmacist if you are taking other products that cause drowsiness including alcohol, antihistamines (such as cetirizine, diphenhydramine), drugs for sleep or anxiety (such as alprazolam, diazepam, zolpidem), muscle relaxants, and narcotic pain relievers (such as codeine). Check the labels on all your medicines (such as allergy or cough-and-cold products) because they may contain ingredients that cause drowsiness. Ask your pharmacist about using those products safely. Cigarette smoking decreases blood levels of this medication. Tell your doctor if you smoke or if you have recently stopped smoking. This medication may interfere with certain laboratory tests, possibly causing false test results. Make sure laboratory personnel and all your doctors know you use this drug. OVERDOSE: If overdose is suspected, contact a poison control center or emergency room immediately. US residents can call the US National Poison Hotline at 1-800-222-1222. Canada residents can call a provincial poison control center. Symptoms of overdose may include: fast/slow/irregular heartbeat, trouble breathing, seizures.